Paul Mason’s “Post-Capitalism” is an interesting book. It often feels like a work in progress, and I often disagree with his ideas, but it is the kind of book that makes you think, so it’s definitely worth reading even if you don’t think you’re likely to agree with his conclusions. The book at times reminded me of a course I had to take back in 1991 in the “theory of science of the humanities” as part of my linguistics degree at Aarhus University. My teacher was a young Marxist who was completely freaked out by the collapse of Communism and spent most of the time insisting that Marxism was right and that the collapse must be due to some specific errors made by later interpretations — Marx himself had to have been right. Paul Mason seems to view Marxism in a similar fashion (but he is much more convincing that my teacher was back in 1991). His heroes are people like Ricardo, Marx, Kondratieff and Bogdanov, but he’s very critical of Lenin and especially Stalin and his acolytes. There’s nothing wrong with that per se (I don’t care where an idea comes from so long as it is good) but at times it’s like Paul Mason is willing them to be right — he seems to be hoping the financial crash of 2008 will be the event that triggers the advent of real Communism as envisaged by Marx. Sometimes I agree with his hopes. As somebody who has been part of the Open Source movement for a very long time (I installed Linux for the first time in 1994, made my first Wikipedia edit ten years later and participated in the first Wikipedia conference, Wikimania, in 2005), I would dearly want the future to be a place where intellectual collaboration replaces suffocating uses of copyright and patents. However, I’m not entirely sure this is enough to make it happen. One specific problem I have with this book is the length of the economic cycle. However, Strauss and Howe argue rather convincingly in “Generations ” that the normal cycle length in human societies is about 80 years (because this is the time it takes for everybody who remembers the errors made last time to have died (or at least have grown so old that nobody will listen to them). I find it much easier to find current parallels with 1935 than with 1960-65. This matters because one of Paul Mason’s main arguments is that the normal capitalistic cycle seems to have been broken because the economy doesn’t look at all like it did in the sixties — if the cycle length is different, that argument doesn’t hold. Of course, there could actually be two overlapping cycles, an economic one lasting 50-55 years and a societal one lasting 80, but in that case we’ll have to go back a great many years to find a close parallel to the situation we’re finding ourselves in today (see the graph above). 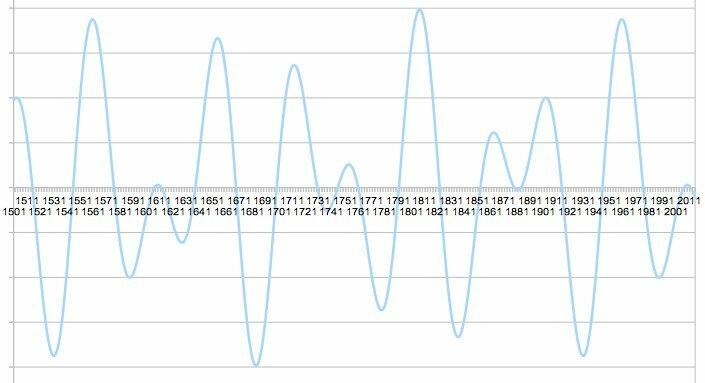 Cycles are very interesting, but I think much more research is needed before we can conclude that the normal cycle has been interrupted. After spending most of the book addressing the history of Marxism and neoliberalism, exploring different theories of value (which I’ll discuss in a separate blog post) and using this and cycle theory to argue that capitalism is dyring, in chapter 9 (“A Rational Case for Panic”) he points out that the current model is also collapsing in other ways, such as climate change and the demographic time bomb. He does make some other suggestions, but it does make sense to focus especially on this. If we had such a model, we could answer many questions much more convincingly. For instance, during the Scottish independence referendum, we would have been able to respond to Project Fear’s scaremongering in a much more authoritative fashion if such a model had been in place. We would also be able to show exactly why austerity is the wrong answer in the present situation and why benefit sanctions don’t increase employment, so this is definitely worth doing. I disagree with many specific ideas in Post-Capitalism, but that’s not a problem. The purpose of this book is to make you think, and it achieves that extremely well. I would definitely recommend reading this book, even if your purpose is to fix capitalism so that it starts working in everybody’s best interest again. Rasmus, har du fået fat på denne bog? Jeg tror, du vil synes, den er interessant.